And there’s more good news coming from the boys in Gym Class – we’re both down 12 pounds in 6 weeks! We’re maintaining a 2-pound per week weight loss – and still eating like Kings! We are pretty psyched! It is definitely not a walk in the park, though. Our trainer is pushing. And pushing. I was on some damned arm machine this morning and in the middle of my second rep of twenty, my arms just stopped working. I could not push that goddamned thing, again. He was singing encouragement and even assisting, but I had reached the end. On the other hand, I had done more this time – with more weight – than I had the last time I was chained to the implement of torture. Baby steps. And the baby steps are starting to show in small, subtle ways… It’s a little easier bringing the laundry up and down the stairs. Victor spent a few hours gardening, yesterday, and wasn’t winded and feeling like crap, afterwards. I walked back from the garage after dropping the car off for its annual inspection and wasn’t winded, at all. We’re both moving easier. I wish I had been doing this 20 years ago, but, better late than never, right?!? Right. Aches and pains, aside, we’re feeling pretty good about this. 6 weeks down, 46 weeks to go for this chapter. Totally doable. Also totally doable was tonight’s dinner. I marinated a couple of steaks in red wine, balsamic vinegar, olive oil, garlic, oregano, and a pinch of S&P. Onto the grill. Pretty simple. 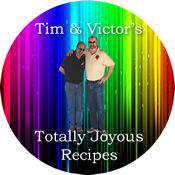 They were two 6 oz sirloin steaks I cut in half – poor man’s tournedos – and we actually each only ate one! It seems we’re actually learning to stop eating before we’re gorged! The fun dish was leftover eggplant stuffing from last night. It went into a skillet, got nice and hot, and then I fried a couple of eggs and dropped them on top. Yes, it was a bit of protein overkill, but I felt like celebrating – and ice cream is currently not on the weekly shopping list! We’ll each have a session at the treadmill this weekend, and on Monday – Week Seven begins. This is going pretty quickly!